Listen to "The Bible: A Biography" on your iOS and Android device. As the work at the heart of Christianity, the Bible is the spiritual guide for one out of every three people in the world. It is also the world's most widely distributed book-it has been translated into over 2,000 languages-and the world's best-selling book, year after year. But the Bible is a complex work with a complicated and obscure history. Made up of sixty-six 'books' written by various authors and divided into two testaments, its contents have changed over the centuries. The Bible has been transformed by translation and, through interpretation, has developed manifold meanings to various religions, denominations, and sects. 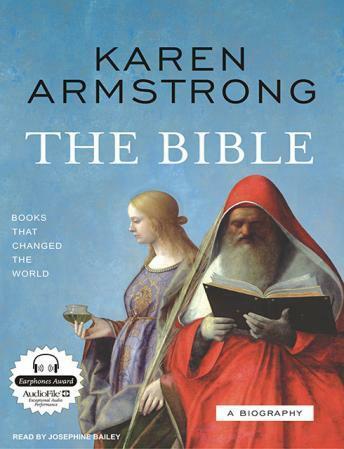 In this seminal account, acclaimed historian Karen Armstrong discusses the conception, gestation, and life of history's most powerful book. Armstrong analyzes the social and political situation in which oral history turned into written scripture, how this all-pervasive scripture was collected into one work, and how it became accepted as Christianity's sacred text. She explores how scripture came to be read for information and how, in the nineteenth century, historical criticism of the Bible caused greater fear than Darwinism. The Bible is a brilliant, captivating book, crucial in an age of declining faith and rising fundamentalism.